Conventional wisdom holds that during the Mesozoic Era, mammals were small creatures that held on at life's edges. But at least one mammal group, rodent-like creatures called multituberculates, actually flourished during the last 20 million years of the dinosaurs' reign and survived their extinction 66 million years ago. 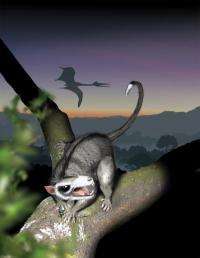 New research led by a University of Washington paleontologist suggests that the multituberculates did so well in part because they developed numerous tubercles (bumps, or cusps) on their back teeth that allowed them to feed largely on angiosperms, flowering plants that were just becoming commonplace. "These mammals were able to radiate in terms of numbers of species, body size and shapes of their teeth, which influenced what they ate," said Gregory P. Wilson, a UW assistant professor of biology. He is the lead author of a paper documenting the research, published March 14 in the online edition of Nature. Some 170 million years ago, multituberculates were about the size of a mouse. Angiosperms started to appear about 140 million years ago and after that the small mammals' body sizes increased, eventually ranging from mouse-sized to the size of a beaver. Following the dinosaur extinction, multituberculates continued to flourish until other mammals  mostly primates, ungulates and rodents  gained a competitive advantage. That ultimately led to multituberculate extinction about 34 million years ago. The scientists examined teeth from 41 multituberculate species kept in fossil collections worldwide. They used laser and computed tomography (or CT) scanning to create 3-D images of the teeth in very high resolution, less than than 30 microns (smaller than one-third the diameter of a human hair). Using geographic information system software, they analyzed the tooth shape much as a geographer might in examining a mountain range when charting topography, Wilson said. The work involved determining which direction various patches of the tooth surfaces were facing. The more patches on a tooth the more complex its structure, and the most complex teeth show many bumps, or cusps. Carnivores have relatively simple teeth, with perhaps 110 patches per tooth row, because their food is easily broken down, Wilson said. But animals that depend more on vegetation for sustenance have teeth with substantially more patches because much of their food is broken down by the teeth. In multituberculates, sharper bladelike teeth were situated toward the front of the mouth. 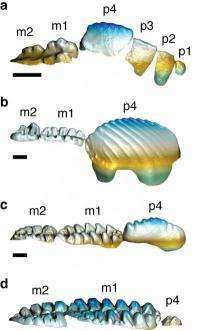 But the new analysis shows that in some multituberculates these teeth became less prominent over time and the teeth in the back became very complex, with as many as 348 patches per tooth row, ideal for crushing plant material. "If you look at the complexity of teeth, it will tell you information about the diet," Wilson said. "Multituberculates seem to be developing more cusps on their back teeth, and the bladelike tooth at the front is becoming less important as they develop these bumps to break down plant material." The researchers concluded that some angiosperms apparently suffered little effect from the dinosaur extinction event, since the multituberculates that ate those flowering plants continued to prosper. As the plants spread, the population of insect pollinators likely grew too and species feeding on insects also would have benefited, Wilson said. Teeth: a future renewable natural resource?